In 1887, young heiress Edith (Mia Wasikowska) is visited by her mother's ghost, who warns her to "Beware of Crimson Peak." Several years later, English aristocrat Sir Thomas Sharpe (Tom Hiddleston) visits Edith's father, seeking investment for a new invention; shortly after he refuses to finance the creation, he is brutally murdered. 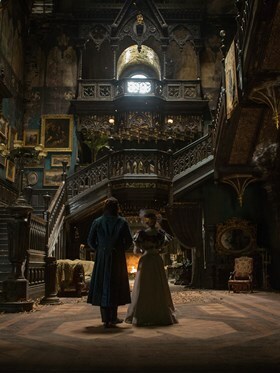 Seduced by Thomas, and intrigued by his beautiful sister Lucille (Jessica Chastain), Edith returns with the siblings to England and their family home: a house of horrors unofficially dubbed Crimson Peak. Del Toro's gothic romance takes inspiration from Ann Radcliffe, Horace Walpole, Edgar Allan Poe and Daphne DuMaurier.